For starters, I ingested a lot of history on Ruby. Thank you Skillcrush! It is a fascinating language and I can see why there is such demand for it. Here is another article stating so. I was first taught how to access the terminal. I started out using my Chromebook in which case I had to download Codio and ‘fire up’ the terminal. When the iMac arrived I was able to access the terminal via spotlight, searching for ‘terminal’. I then practiced using the most common terminal commands. The screen capture below represents the coolest terminal command! Mid-week it was time to install Ruby. I was feeling pretty lucky since my iMac came with the updated Ruby already on it. But then I found out that all UNIX products come with Ruby installed. Thank you Apple! Installing “Ruby is the hardest step in learning it.” At least, according to the programming community. Since I took the Codeschool Ruby course last week, learning Objects, Strings, Methods, Arrays, Hashes was familiar. That being said, I needed to practice, practice, practice! 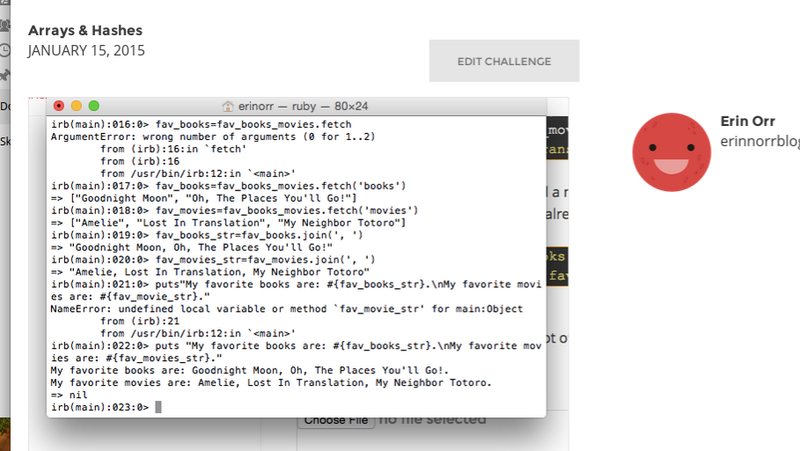 Below is another screen capture, this time of my work with IRB (Ruby) in the terminal. I also was introduced to NIL, or nothing. Last but not least I am reading my very first programming book. It is called _Why’s poignant guide to Ruby and it’s written by a “mystery guy” or x-mystery guy. His name is _Why. It is really funny and hard to put down. Ruby and I are off to a great start!